The history of Madison Square Garden dates back centuries, and it’s a history that is vibrant and full of excitement and transformation. It was named for James Madison, the fourth president of the United States. It has seen many changes, both in location, architecture, and purpose and it is still a prominent area in the landscape of New York City. Madison Square Park is bordered by Fifth and Madison Avenues and 23rd and 26th streets. It is located in the Flatiron District and is full of 19th century statues and landmarks from the Gilded Age. 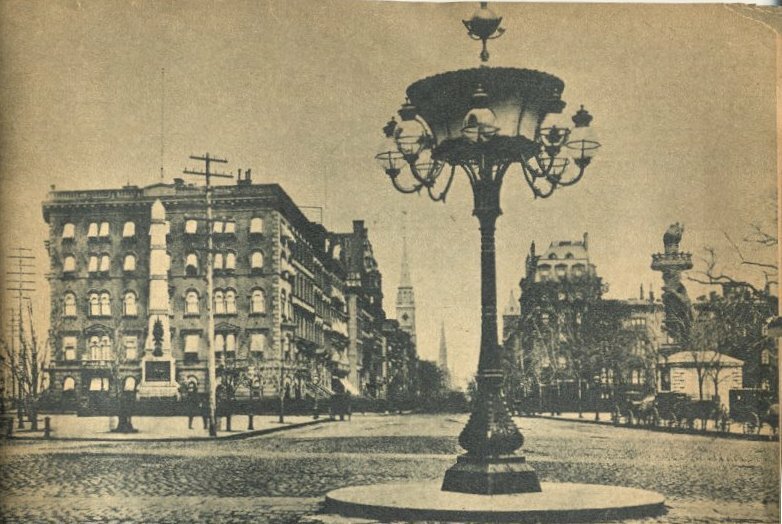 Madison Square has had many different functions and was, at one time, the center of the city. What began as a swamp has led – after about three centuries – to one of the most popular arenas in the world. Madison Square, the area that shares its name with the current Madison Square Garden, began as a natural, wooded area. It’s ironic that, for a place that is so heavily populated today, the Lenape Indians found no value in the area. Starting when the Dutch arrived in the early 1600s, the swampy land was used as a hunting ground. Since that initial habitation, the land has been greatly utilized by the people living around it. Beginning in 1807, the area where Madison Square now sits became known as “The Parade.” It was transformed from a swamp into an arsenal and a barracks, used by the military. In 1825, the arsenal became a house of refuge and was used by the Society for the Protection of Juvenile Delinquents for adolescents who were committed by the courts. Children who were taken from their parents because of mental or physical ailments live on this land. This was the purpose of the park until the building burned in 1938 and a cottage was built. The cottage was named “Madison Cottage” by William “Corporal” Thompson and the land took on the same name. The cottage was a stopping point for immigrants either moving to or from the north. The land took on the role as an unofficial public park. It is suggested that the game of baseball began in Madison Square, as the New York Knickerbocker Base Ball Club was the first organized, professional club to play the sport. “The club first started play in 1842, but it was not until 1845 that the club formally organized. Under the leadership of club president and committee chairman Dr. Daniel Lucius Adams, the Committee to Revise the Constitution and By-Laws created a set of 20 rules to govern the club” (Briggs). Alexander Cartwright was instrumental in the creation of the rules and the sport. Madison Square Park in 1896. 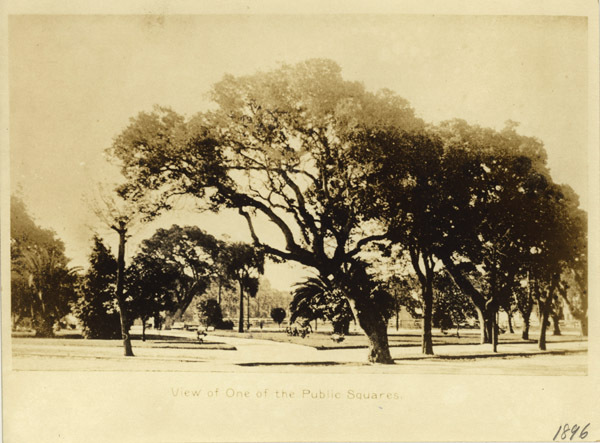 Madison Square was opened as an official public park on May 10, 1847. Madison Cottage stood until 1853 and was destroyed to make way for the Fifth Avenue Hotel. 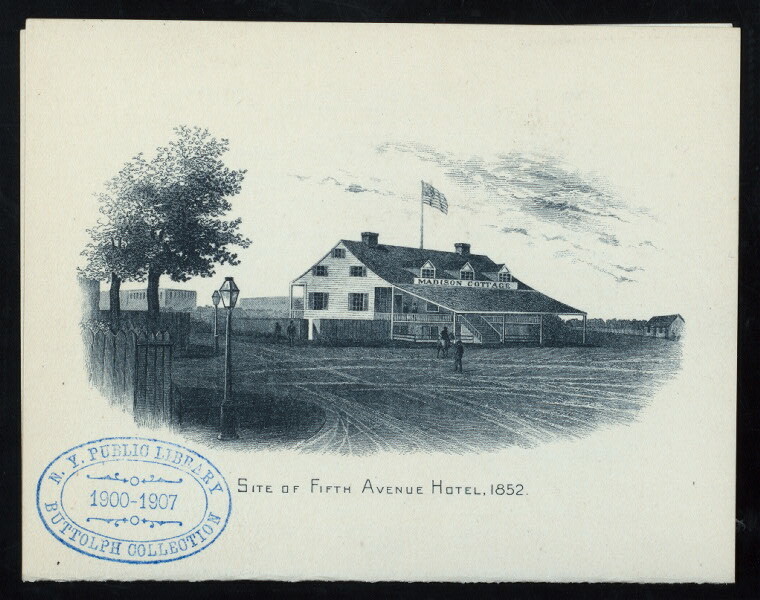 This hotel, which opened in 1859, was the first to use an elevator and to offer such luxurious accommodations. The hotel was home to many wealthy New Yorkers and politicians and hosted most of New York’s most elegant events. Along with the hotel came Madison Square’s growth and place as the center of New York City. “With the opening of the Fifth Avenue Hotel, the area started to become the center of New York’s social life. Many major hotels moved into the area, followed by retailers and the entertainment industry” (Madison). Venues such as Madison Square Theatre and the Chickering Hall came to Madison Square, establishing even more it’s place as the center of the city. Madison Square Park with the Fifth Avenue Hotel to the left and the torch from the Statue of Liberty on the right. The park remained a huge part of the landscape of New York City and was relandscaped by William Grant and Ignatz Pilat in 1870. With this renovation came many statues and sculptures that are still present in the park today. There is a memorial dedicated to Secretary of State William H. Seward, who is remembered for purchasing Alaska from Russia. There are also statues of Roscoe Conkling, President Chester Alan Arthur and Admiral David Farragut. An ornate fountain was also brought to the park. In 1876, as a part of the centennial celebration of the signing of the Declaration of Independence, the torch and arm of the Statue of Liberty were put on display in the park. There were displayed as a way to make money for the construction of the Statue of Liberty. The first Madison Square Garden was built in 1879. It was built in the place of an old hippodrome. Madison Square Garden was a cycling venue and led to Madison racing, a bicycling event that is still an Olympic sport. The race is a treacherous one, that “confirms the assumption, no longer much contested, that the human animal is superior to other animals. This undisputed thing is being said in too solemn and painful a way at Madison Square Garden” (A Brutal). This arena hosted circuses and boxing matches and held 10,000 spectators. It was also the site of the first indoor ice hockey rink in the United States. As with many things in New York City during this time, the Vanderbilt family was instrumental in the creation and operation of the arena. The second Madison Square Garden, with Diana on top of the tower. The first Madison Square Garden was demolished and replaced with the second arena in 1890. It was designed by Stanford White, an architect who lived in the tower of the arena. Ironically, White was killed in 1906 in Madison Square Garden’s rooftop restaurant. This arena was designed with Moorish influenced architecture and had a tower that reached 32 stories above Madison Square Park. The second Madison Square Garden was topped with a copper statue of Diana that spun with the wind. The statue gave Madison Square the nickname “Diana’s little wooded park”. At the time of it’s construction, this building was the second tallest in New York City. It had seating for 8,000 and floor space for thousands more. With the new Madison Square Garden, Madison Square remained at the center of one of Manhattan’s most elite areas. At the turn of the 20th century, Madison Square and the area around it became the home to several new tall buildings. 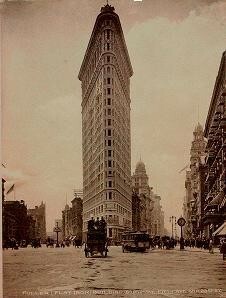 First, in 1902, the Flatiron Building was erected. It was daringly thin and its shape gave it the name “Flatiron”. Then, in 1909, the MetLife Tower was built. At 51 stories, it was the tallest building in the world. Madison Square was home of the first Christmas tree in New York. The large community tree was on lit up on Christmas Eve in 1912. In her novel, My Mortal Enemy, Willa Cather describes Madison Square circa 1915 in this way: “Madison Square was then at the parting of the ways; had a double personality, half commercial, half social, with shops to the south and residences to the north. It seemed to me so neat, after the raggedness of our Western cities; so protected by good manners and courtesy – like an open-air drawing-room” (Cather). It was a place of great wealth and lavish surroundings. It was defined by its commercial and social atmostphere and was host to many elite events and people in Manhattan. Just before the second Madison Square Garden arena was destroyed, it hosted the 1924 Democratic National Convention. 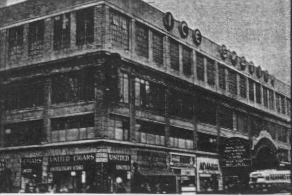 Shortly after the convention, the building was torn down and the New York Life Insurance Building was built. This building, with it’s gold top, is one of the most beautiful and recognizable landmarks in New York City today. The third Madison Square Garden was moved from Madison Square and built on 50th Street and 8th Avenue. It opened in 1925 and held nearly 18,500 spectators. Tex Rickard built the arena and it became known as “The House that Tex Built”. The arena was host to the New York Knicks, New York Rangers and many entertainment events. The Ringling Bros. and Barnum & Bailey Circus originally performed at the second Madison Square Garden in 1919 and were a huge success. They continued to perform in the new arena as many as three times a day well through the 1930s. Though it held countless NBA and NCAA basketball games and entertainment and political events, this particular MSG was known mostly for its boxing matches. It is the backdrop for the 2005 film Cinderella Man and was home to many of the most watched boxing matches to date, showcasing boxers such as Fritzie Zivic, Henry Armstrong and Jack Dempsey. The arena was torn down in 1968 and is now the home to the Worldwide Plaza. 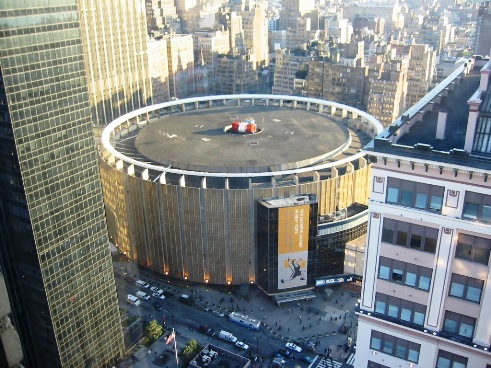 Finally, the fourth Madison Square Garden was opened in February of 1968. Under the direction of R.E. McKee, the structure of the building is very unique. It is situated on top of Pennsylvania Station, on 8th Avenue between 31st and 33rd Streets. Irving Mitchell Felt, the chairman of Madison Square Garden, said “it stands at the true center of America’s commerce industry, culture and the arts. It is a world center” (Hollander). The Garden now plays host to the St. John’s Red Storm, the WWE, New York Rangers, New York Knicks, New York Liberty, New York Titans, New York Knights and New York CityHawks. It has hosted both the Republican and Democratic National Conventions. It is also home to numerous graduations and award shows. Madison Square Garden, which underwent massive renovation in 1991, has hosted many historical events. These include the first Joe Frazier-Muhammad Ali fight and the Westminster Kennel Club Dog Show. The most popular and prominent musicians have performed in Madison Square Garden. Billy Joel said, “Madison Square Garden is the center of the universe as far as I’m concerned. It has the best acoustics, the best audiences, the best reputation, and the best history of great artists who have played there. It is the iconic, holy temple of Rock and Roll for most touring acts and being a New Yorker, it holds a special significance to me” (MSG.com). Madison Square Garden has been the backdrop for many television shows and movies and is even referenced in video games. This building is unique in accessability, structure and adaptability. With 200,000 people passing through Penn Station every day, and the scope of events that the arena has to offer, it seems there is nothing this building can’t do or hasn’t done. 1. “A Brutal Exhibition.” New York Times 11 Dec. 1897: 8. Print. 2. Briggs, Mike. “Knickerbocker Base Ball Club of New York – BR Bullpen.” Baseball-Reference.com – Major League Baseball Statistics and History. 1 Nov. 2006. Web. 17 June 2010. <http://www.baseball-reference.com/bullpen/Knickerbocker_Base_Ball_Club_of_New_York&gt;. 3. Cather, Willa. My Mortal Enemy. New York: A.A. Knopf, 1926. Print. 4. Hollander, Zander. Madison Square Garden; a Century of Sport and Spectacle on the World’s Most Versatile Stage. New York: Hawthorn, 1973. Print. 5. Jackson, Kenneth T. The Encyclopedia of New York City. New Haven, Conn.: Yale UP, 1995. Print. 6. “Madison Square, New York City.” A View On Cities. Web. 16 June 2010. <http://www.aviewoncities.com/nyc/madisonsquare.htm&gt;. 7. “Madison Square Park – Historical Facts.” Madison Square Park Conservancy – Home. Web. 16 June 2010. <https://www.madisonsquarepark.org/about/historicalfacts.aspx&gt;. 8. 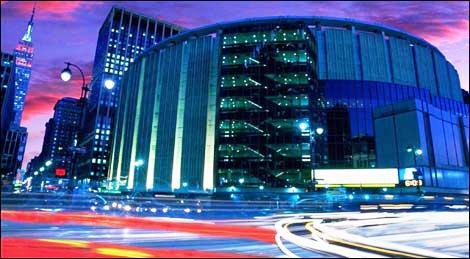 “MSG.com – Press Releases – Madison Square Garden, Radio City Named Venues of the Decade.” MSG.com – Home. 21 Dec. 2009. Web. 16 June 2010. <http://garden.msg.com/pressreleases/msg-radiocity-venues-of-the-decade.html&gt;. 10. “New York Architecture Images- Madison Square Garden.” Nyc-architecture | New York Architecture- Historic and Contemporary. Web. 17 June 2010. <http://www.nyc-architecture.com/GON/GON016.htm&gt;. 11. Schumach, Murray. “Ext and Last Attraction at Old Madison Square Garden to Be Wreckers’ Ball.” New York Times 14 Feb. 1968. Print.